The legend goes like this: After God finished molding Man from earth, he took the remaining material, shaped it into a date palm, and placed it in the Garden of Eden. Dates are mentioned more than 50 times in the Bible and 20 times in the Qur’an. There were dates everywhere in Abu Dhabi. The Arabian native fruit is an ancient sign of hospitality. Dates were essential to the survival of Arab tribes. The fruit was an essential part of their diet; they consumed several pounds of dates a day, washed down with camel milk. And the date palm tree was used for everything from fabric to lumber. 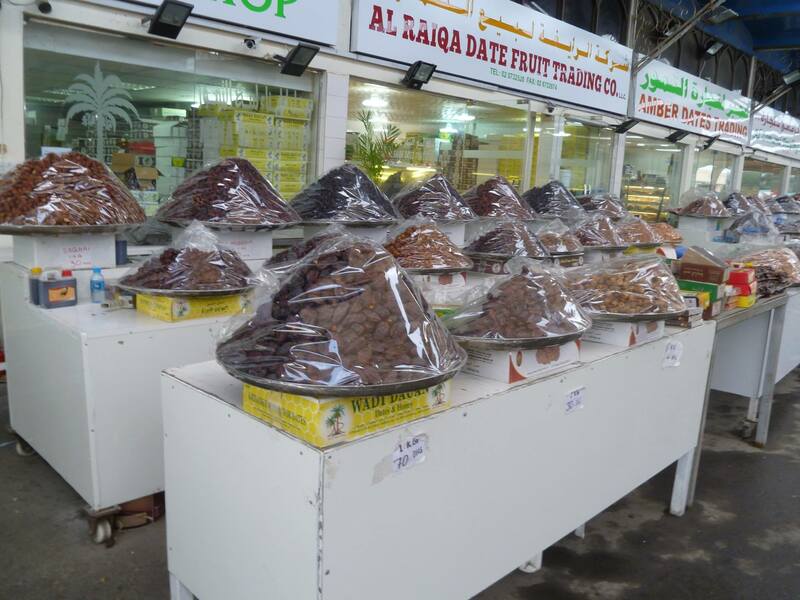 There are more than 100 varieties of dates, mostly grown in Egypt, Saudi Arabia, Iran and the United Arab Emirates. I saw a dizzying array of them at an Arab version of a farmer’s market on the outskirts of Abu Dhabi. You could get everything at this market: fruits, vegetables, grains, meat, fish. There was an entire row of date vendors. At one shop, I asked the vendor to make up a sampler of every variety he sold. They were different colors, and some were drier than others — but honestly, to me, one pretty much tasted like another. I assume a native palate would be able to discern the differences. We also saw a date palm orchard at the oasis of Al Ain. Our guide told us the Emiratis take great pride in serving dates harvested from their own plot of land. Dates are a heart-healthy food, low in cholesterol and rich in potassium and iron. The average date has about 25 calories. That is, until you turn them into an incredible appetizer, Devils on Horseback. My friend Paula turned us on to them years ago – she stuffed them with goat cheese, wrapped them in thin-cut bacon, and broiled them until the bacon was done. (Obviously a Muslim wouldn’t wrap a date in pork!) The contrast of salty, sweet and creamy is amazing. Oh, I can taste them, sounds like such an adventure!